Korean star JANG Hyuk is back before cameras for the upcoming period action film Swordsman (translated title), which began production on June 15th. Also on board are JUNG Man-sik, Indonesian action star Joe Taslim, in his Korean film debut, and Kpop idol LEE Min-hyuk of BTOB. Set in the Joseon Era, Swordsman will feature JANG Hyuk as a blind swordsman who looks after his daughter. 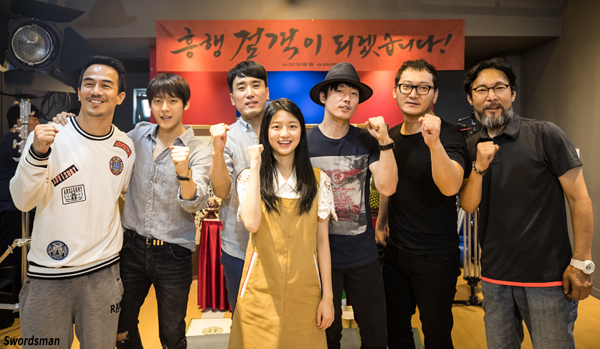 JUNG Man-sik has been tapped to play a military official, LEE Min-hyuk will play a warrior for the king, who will be played by JANG Hyun-sung (Spider Forest, 2004), KIM Hyeon-soo will play JANG’s daughter and CHOI Jin-ho (INSANE) has signed on to play a military assistant for the Qing Empire. JANG Hyuk, who was last seen in the 80s-set political murder mystery ORDINARY PERSON, is known for works such as Volcano High (2001) and Windstruck (2004). JUNG Man-sik is an active character actor whose credits include last year’s Asura: The City of Madness and The Tiger (2015), as well as ORDINARY PERSON, while Joe Taslim gained his fame by featuring in the breakout 2011 Indonesian action film The Raid and has since had roles in Hollywood blockbusters such as Fast & Furious 6 (2013) and Star Trek Beyond. The film is the debut of director CHOI Jae-hoon, who previously worked in the art departments of films such as Princess Aurora (2005) and Detective ODD (2006). Opus Pictures, previously responsible for New Trial and ORDINARY PERSON, among others, is producing Swordsman, which will see release at some point next year.